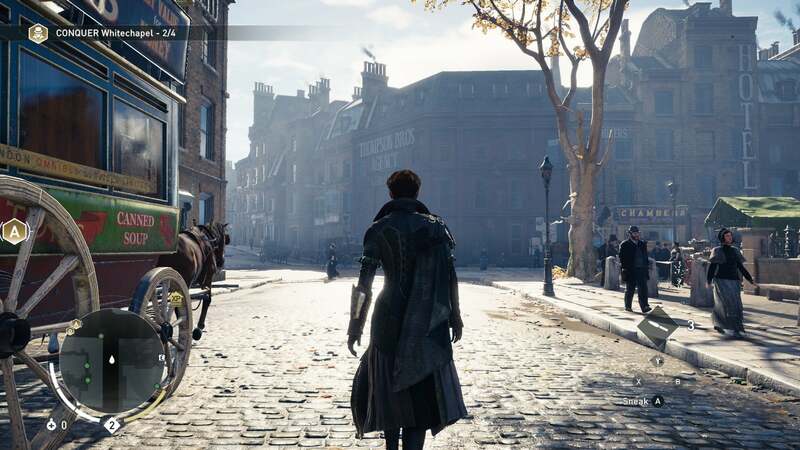 I don’t know whether we have the month-long delay on Assassin’s Creed Syndicate’s PC version to thank, but hooray: It runs. I’m maybe six hours into the game and haven’t hit any major bugs, though there are some minor jitters and a bit of slowdown here and there. Some pop-in. Some weirdly low-res textures at times. Nothing too serious. Nothing at all on par with last year’s Assassin’s Creed Unity debacle. Nothing game-breaking. More importantly, I think it’s worth noting the game is really pretty and has brought my 980 Ti to its knees even at 1920x1080. I can run the game at Ultra settings, but doing so drops me to around 45 frames per second (compared to 70-80 at “Very High”). I dipped a few of the Nvidia-specific settings since I prefer smooth, buttery frame rate, but that’s impressive in itself given it’s the only game this year to make that happen. I don’t think it’s because of poor optimization, either. 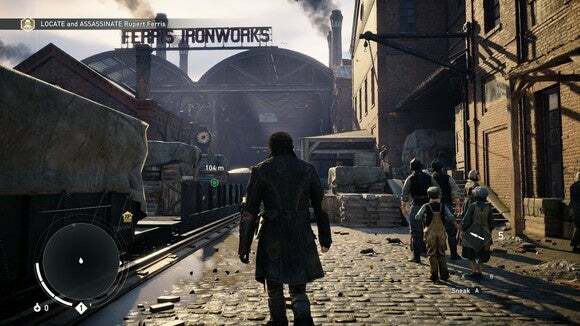 I think the game mostly earns it, especially by cranking the draw distance way out to the horizons, rows and rows of Victorian-era smokestacks pumping coal into the London sky. Although we did lose Unity’s massive crowds this year—London’s streets are noticeably emptier than Paris’s, and the civilians quite a bit dumber. The one perpetual issue I’ve noticed is that your character’s clothing is a bit herky-jerky. It looks almost as if the animation is running at 30 frames per second even though the game is running more than twice as fast. I don’t pay attention to it often, but sometimes it catches my eye and I find myself watching Evie’s robes twitch around haphazardly. Ugly. Other than that, no major issues to report. Steam reviews and Reddit threads seem to agree it’s an all-around improvement over Unity—and that’s (at least when I’m writing this, on early Thursday morning) before Nvidia’s even released its Syndicate-specific drivers. I have seen a few complaints here and there—some complaining about frame rate issues, a couple about texture bugs—but nowhere near the level of vitriol I saw after last year’s release. That goes for the actual content of the game too. The twin siblings Evie and Jacob are both genuinely charismatic, the more egregious parts of Unity’s design (companion apps, et cetera) have been pared back, and Austin Wintory’s score is mesmerizing. It’s a lot more cartoony than usual—more a parody of history than anything else—but at least I’m casually enjoying myself. Unity bored me to tears. Syndicate is a lot less self-serious, and maybe that’s a good thing. It’s too early for me to tell. 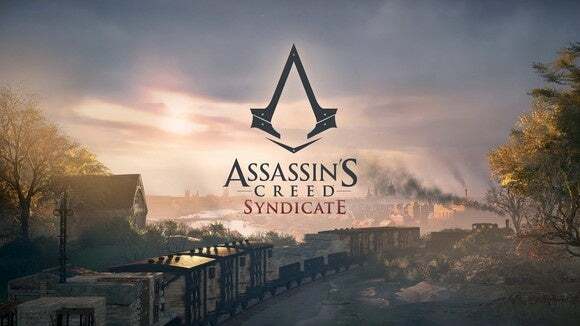 I’ll be keeping an eye on general Internet buzz over the next few days to see if widespread issues start cropping up—and playing through the game myself, of course—but for the moment Syndicate seems fine. Though if you’re going to purchase it, I’d urge you to buy through Steam and leave yourself the option of a refund. Syndicate is a good start, but I still trust Ubisoft’s PC ports about as far as I can throw a copy of Assassin’s Creed Unity. Which is about three feet from here to the nearest trash can.